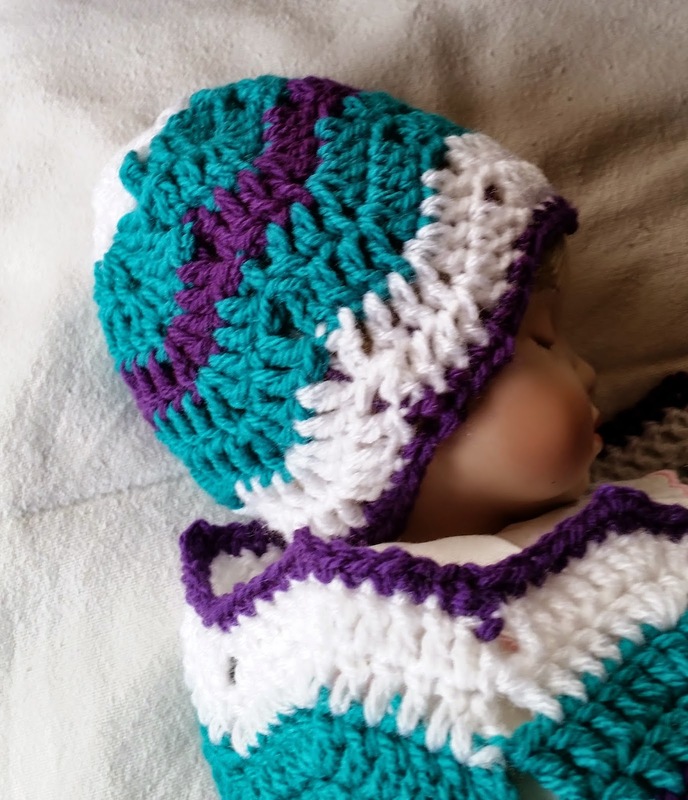 Today I have a beautiful crochet pattern for a baby cocoon with a hat to match. I have been dying to make one for ages. I have hunted around for a pattern that I could follow. But I find some patterns just don't work out for me as written, and I get very frustrated. But when I go through the pattern word for word I realise certain bits have been missed out or written incorrectly and I end up re-writing it in a manner that I can understand. So my hat goes up to those who do write these as I have found it isn't as easy as one thinks. I love the chevron crochet pattern and wanted to have it in my project. I love colour and wanted a bold coloured pattern. I like to see babies in colour instead of pale pinks and blues. We are sold bright coloured toys to stimulate babies, along with bedroom accessories, prams, pushchairs etc, so why not garments? This pattern I have written I hope is fool-proof. I keep going over it to make sure it is user friendly and correct. But, I welcome any feedback on it. It is my first and certainly won't be my last. 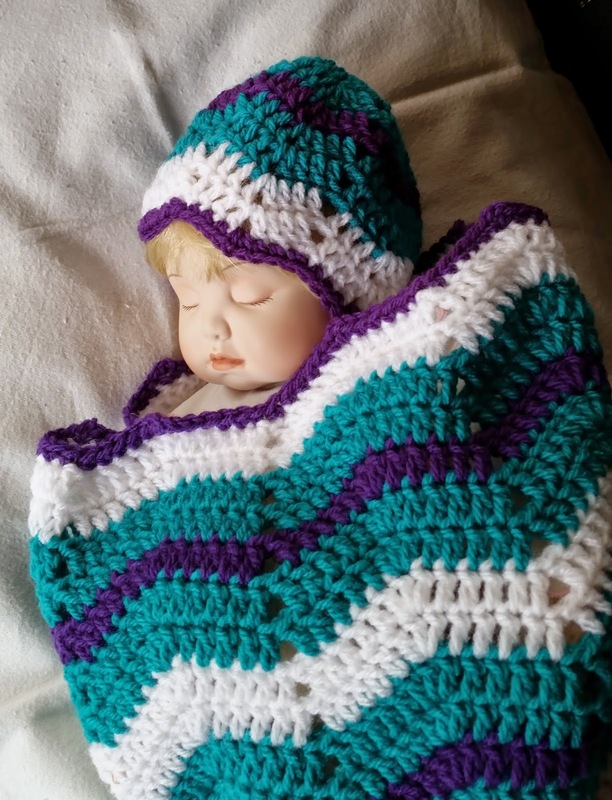 I have created this cocoon and hat in a DK yarn of three different colour choices. I have to point out that the darker the yarn the thicker it felt. The white felt considerably thinner, though it was of the same brand. So you may find your finished project different in size. So be aware of that. Measurements given are only a guideline to follow. And the sizing is for a newborn, but as you know newborns come in different sizes too. So take this into consideration. 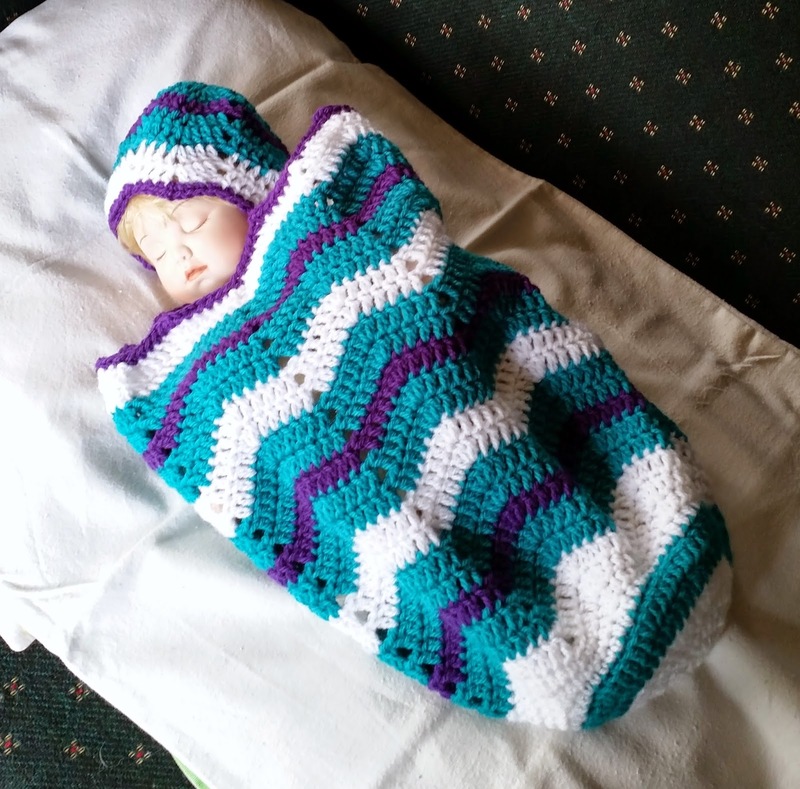 The baby doll I used for the photos is of a preemie sized baby, and the cocoon and hat are a little large for it. So make some allowances for the size you want to make. To make it larger use a larger hook, or increase your stitches making sure the repeat pattern is accounted for; and increase your final amount of rows. I hope you have fun creating this pattern. 'Knowledge is for Sharing and Crafting is for Everyone'!